Love Cinese fried rice. I don’t add ajino moto though. Fried rice looks really yummy. Left over rice is best utilized to make such rice dishes. Sandeepa dosa’s are his fav:) It was just for me so I added ajinomoto. When I make for all of us even I don’t. Simple Indian food, desi version is one of our fav’s. we like the spiciness and flavors in this dish. Pravs, You are absolutely right. Thanks for dropping by. Ruchi & Kalva, truly delicious. Thanks for dropping by. beautiful dish. i love your blog template. Thanks lissie, I often end up making mix rice dishes with leftover rice. Happycook, even I do that sometimes:)… but this is one of my husband’s fav. Thanks for your sweet compliment bee. I loved the presentation girl. And Chinese food cooked in desi style is excellent. very neat and clean recipe .Awesome color too ….. Thanks Seema, good to see u back. Glad you liked Rajitha, Thanks for dropping by. Thanks Deepa.. Infact it’s really easy dish. Fried rice from left overs! Looks yumm..
lovely pics in your blog! That looks beautiful! I love the photo! Nice dish too. I bet it was very delicous. Thanks Rachel, at my place often left over rice turns into fried rice or mix rice. Thanks Jenn, So sweet of you to say that. Fried rice was delicious. I think all Indian love this one. As soon as I make the next batch (obbattu) I will post it to you :). May be I will make half ur dates obbattu and half with puranam. Take it easy Siri, do u need any help with ur assignments ;). Drive down to my place. I will make you nice hot lunch. I am so happy! I love fried rice and this is the second time tonight I am seeing a fried rice recipe! Yours looks amazing! This looks delicious! I love the picture, and I totally love the colors of your blog. 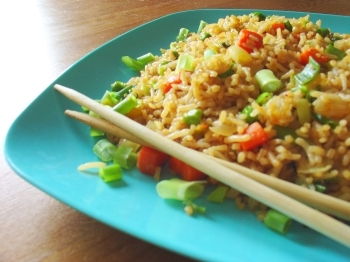 Yummy fried rice.The picture is looking great.Enjoy! Thanks Cynthia, Oh I remember seeing fried rice recipe in ur blog.I bet that tasted really delicious. Thanks and welcome to my virtual kitchen Kaykat. hey it was relly a nice recipe…. As being a student it hlpd me a lot ….